New Research 2017: During 2017 at Baymard Institue we’ve published a revised Homepage & Category benchmark, and a completely new study on Product Details Page UX. It interesting to see that despite how the Product Details Page is just a single page-type in the overall e-commerce experience, there’s a very high complexity in achieving a ‘State of the Art’ product page user experience. For example, our testing findings reveal an even higher number of page and UX elements that impact Product Page UX than for either Category Navigation, Search, or Product Listings. 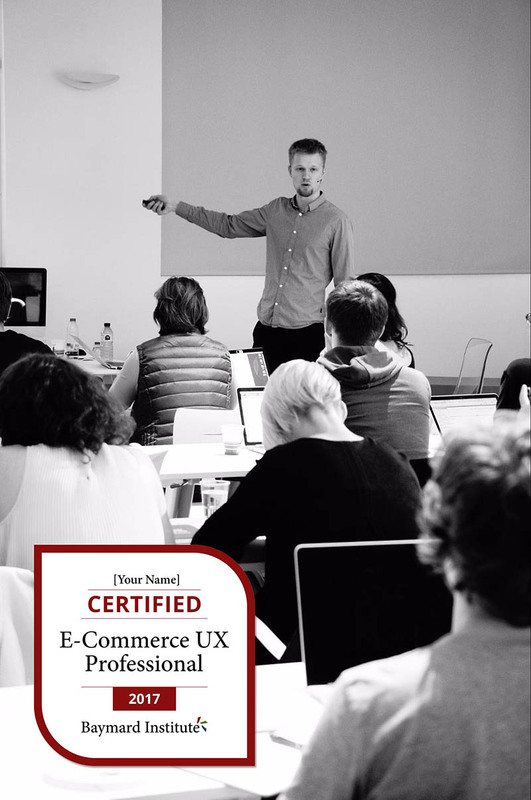 New Training 2017: In 2017 we also launched our in-person E-commerce UX Training & Certification program. If you want a fast paced hands-on approach to consume and apply the findings from Baymard’s 28,000 hours of large-scale e-commerce UX testing, then in-person training is the best option. There’s still tickets left and most people will have a location that is no more than a 1-3 hours direct flight away: Copenhagen (Jan 29-Feb 2), San Francisco (Feb 26 - Mar 2), and New York (Mar 19-23) (note: there will be no other training locations in 2018). If those options doesn’t suit you we also offer in-house training and certification, at your convenience and held at your offices. New Baymard Team Members 2017: At the end of 2017 we also expanded the team, adding Karolina (UX Benchmarking), Jason Fox (UX Researcher), Mark Crowley (UX Researcher), and Saf Allen (Developer) – so we’re now 9 people at Baymard. This significant expansion means you will get even more e-commerce UX research in 2018, and that this will happen at a much higher pace than the past 8 years of Baymard’s existence. There will also be an array of new website improvements, so consuming the research will be improved as well. First Half of 2018: We have a new research study coming out on E-Commerce Account & Self-Service UX (incl. order tracking and returns), along with updated benchmarks for E-Commerce Search UX and Product Lists & Filtering UX. There will also be a major announcement concerning how we publish, structure, and conduct our e-commerce UX research. Something to look forward to. We’d like to thank all our new and the repeat customers for our research studies and for UX audits that we’ve served throughout 2017. Looking forward to 2018! Authored by Baymard Institute. Published on December 18, 2017.